In this beautiful valley, on the banks of a mountain creek, lovers of camping can enjoy the pristine natural environment and benefit from the blend of mountain and sea air. 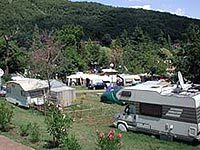 In this unique setting, the completely renovated Camping and Tourist Village Medveja is the ideal destination for a perfect summer vacation. The biggest news is the acquisition of 20 new mobile homes equipped with satellite TV, outdoor fireplace, terrace with table and chairs, deckchairs, and air conditioning. The total size of the new mobile homes is about 32 m2. In 2012, the Medveja campsite and holiday village will continue to be one of the best destinations for summer holidays and fun! The area of the camp is 30.000 m2. It is consist of 500 camp units on 3 levels and 8 bungalows. Camp is located on green surface in pine wood and it's perfect for perfect peace and relaxation. Below the camp is large beach in Icici. Within autocamp is restaurant Triestina where you can enjoy in open air music and dance, grilled specialties ecc. in Camper Nights(July and August). Within camp you can also find open and closed tennis courts. This is a paradise for camping-lovers. It is situated at the very entrance to Moscenicka Draga, and provides everything that you may need on camping. Autocamp has fully developed infrastructure and richly supplied shop is at its entrance. The kind staff, ready to help, is at your service any time you need. At the reception desk you can get all the information you need. There is also a telephone and the exchange office. During the night, the night guard looks after you and your property. The rest of the facilities and services can be found in the centre of the resort which is, as well as the beach only 300 m away from the camp. 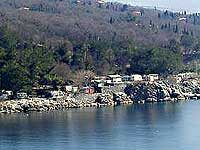 The Preluk campsite for motorists is situated in a small pine and laurel forest next to the sea and a pebbly beach. It is in Preluk, serviced by bus no. 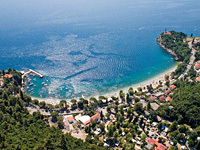 32 which goes to Opatija and is 2 km. from the centre of Opatija. The capacity of the camp is for 500 people. There are shops, a terrace serving grilled food, snack bar, exchange office and a disco bar in the vicinity of the campsite. The camp provides many facilities linked with watersport. Preluk is well-known as a special place for surfing because of the favourable winds which blow in that area, especially in the morning. It offers wonderful views of nearby picturesque places - Volosko, Kvarner islands and the touristic centre of the Northern Adriatic - Opatija. 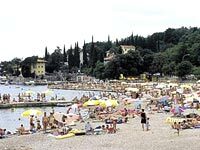 The proximity of Opatija provides camping guests with numerous entertainment amenities and rich gastronomic dishes.